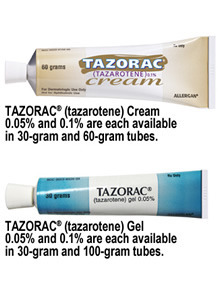 Tazarotene is a vitamin A derivative, topical retinoid used to slow skin cell growth. It is normal for psoriasis plaques to become very red before clearing when using tazarotene. The redness is often intense in color, but it is generally not painful. The most common side effects are skin irritation and dry skin and increased susceptibility to sunburn. Use a sunscreen and wear sun-protective clothing when using tazarotene. If you experience discomfort, burning, itching or stinging, check with your doctor. Treating psoriasis. It may also be used for other conditions as determined by your doctor. 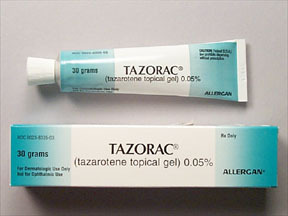 Tazorac Cream is a retinoid. The specific way Tazorac Cream works is not completely understood. It may decrease skin inflammation and skin changes associated with psoriasis. Tazorac is the only retinoid medication applied directly to the affected areas of the skin. It combines the effectiveness of oral retinoids with the safety of a topical product. Because it is applied to the skin, Tazorac can be used to treat mild to moderate cases of the condition -- a major milestone in the development of psoriasis therapies. Another key benefit for psoriasis sufferers is that Tazorac has been found to show improvement in as little as one week, with relief lasting for up to 12 weeks following treatment. Results will vary among patients; most will experience improvement in four to six weeks. With many other psoriasis treatments, the lesions often return as soon as treatment is discontinued. Tazorac is a newer psoriasis gel that may be very effective. Like Dovonex it is irritating, but it has the special benefit of clearing psoriasis for a longer time after it is stopped than any other topical medication. It is often combined with topical steroids to limit the irritation. It is not clear it is safe for pregnant women, and may cause sun sensitivity where it is applied.